The Vikings were truly the lords of the sea. They traveled all over the world, fearlessly daring the seas and oceans. One of their greatest feats of sailing would have to be that they were the first Europeans to reach America. Leif Eriksson landed on the American coast around the year 1000, long before Columbus. 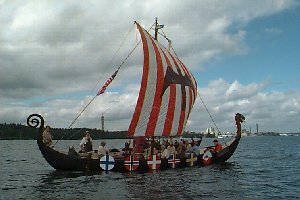 Their Dragonships were not only extemely seaworthy, but they were also great for raiding. They were very fast and allowed a quick attack and fast escape. And a shallow daft made them independent of harbors allowing them to go ashore on any beach. Dragonships can be recognized by their square sail and the dragon head on the bow. 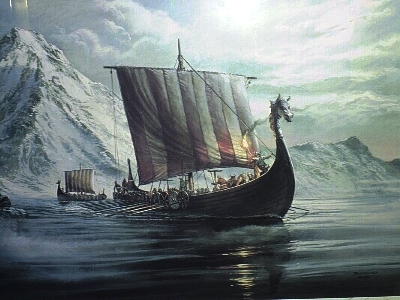 The Vikings had a dragon head on the bow of the ship to protect against the evil spirits of the sea. The hull of the ships were made by overlapping planks and securing them with iron rivets. A wool string was dipped in tar and forced between the planks to prevent leaks. Oak trees were mostly used because their natural branching structure provided curves to create streamlined hulls. Sails were made from woven wool. Natural lanolin made the fabric water repellent. Rigging was made from horsehair or walrus hide. The steering oar was mounted on the rear right side. This combined with a rotating sail made raiding possible regardless of wind direction.